Removal ProcedurePlace the park brake lever in the release position.Raise and support the vehicle. Refer toLifting and Jacking the Vehicle.Remove the tires and wheels. Refer toTire and Wheel Removal and Installation.Remove the exhaust muffler. Refer toExhaust Muffler Replacement. Disconnect the rear park brake cables from the park brakeactuators.Using theJ-37043release tool, remove the park brake cables from the mountingbracketsPosition the rear park brake cables aside.Disconnect the rear wheel speed sensor electrical connectorsand routing clips from the rear support and upper controlarms. Position the wiring harness aside. Remove the rear brake hose bracket nut and bolt. 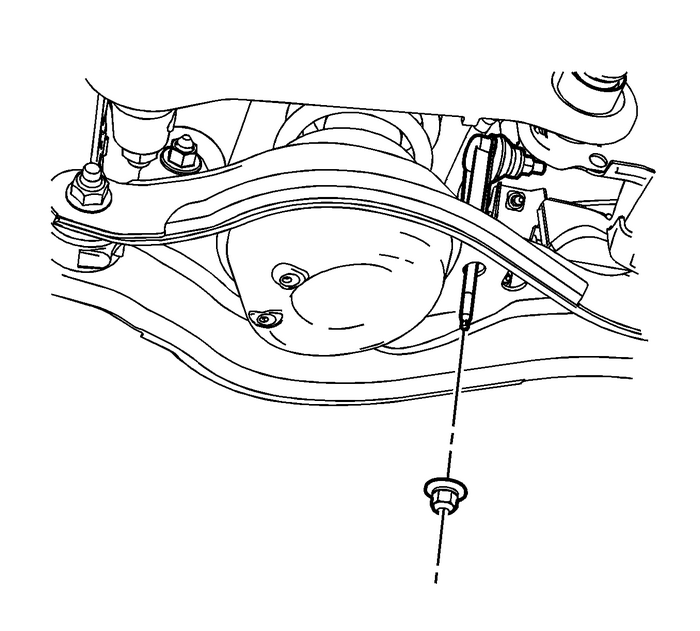 Caution:Support the brake caliper with heavy mechanic wire, orequivalent, whenever it is separated from its mount and thehydraulic flexible brake hose is still connected. 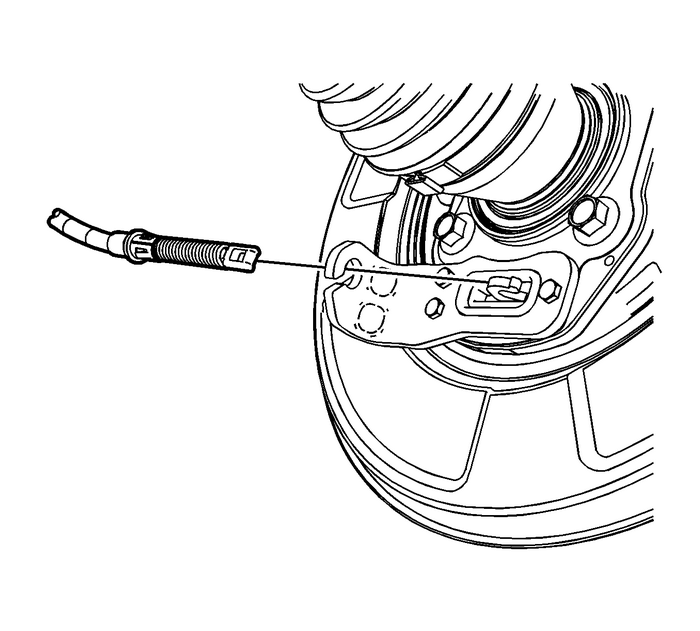 Failure tosupport the caliper in this manner will cause the flexible brakehose to bear the weight of the caliper, which may cause damage tothe brake hose and in turn may cause a brake fluid leak. Remove the brake calipers and brackets as assemblies andsupport them with heavy mechanics wire or equivalent. Refer toRear Brake Caliper Bracket Replacement. Remove the rear park brake cable routing bolts from thetrailing arms. While holding the stabilizer link with a wrench, remove thestabilizer link-to-lower control arm nut.Remove the trailing arms. Refer toTrailing Arm Replacement.Remove the adjustment links. Refer toAdjust Link Replacement.Remove the rear wheel drive shafts. Refer toRear Wheel Drive Shaft Replacement.Remove the rear differential. Refer toDifferential Replacement.Position a transmission jack under the rear support andfirmly secure the support to the jack with straps. Tighten the upper control arm to rear support nut and bolt to160-Y(118-lb-ft). Tighten the lower control arm to rear support nut and bolt to110-Y(81-lb-ft). Tighten the stabilizer shaft insulator clamp bolts to70-Y(52-lb-ft). Tighten the stabilizer link to stabilizer shaft nut to57-Y(42-lb-ft). Knuckles – Loosely install the upper and lowercontrol arm to knuckle nuts/bolts. 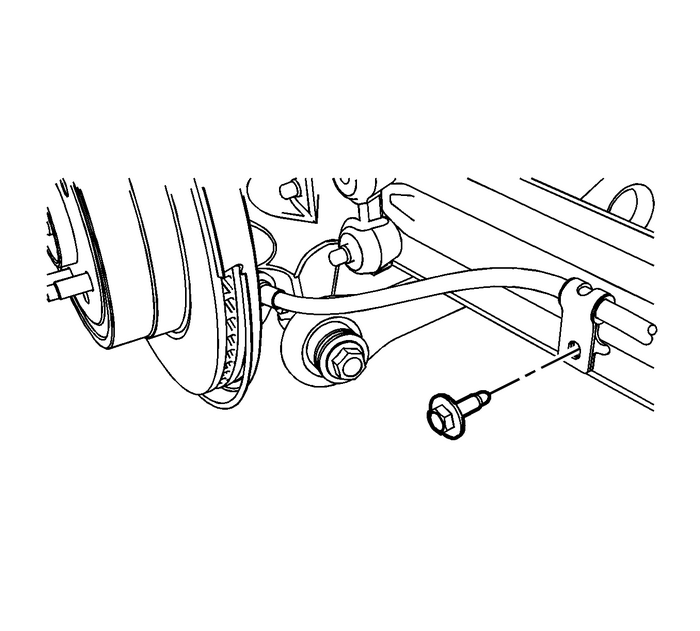 These fasteners will betightened later in this procedure after the wheel driveshafts areinstalled.With the aid of an assistant, position the rear support ontothe transmission jack and firmly secure the support to the jackwith straps.Position the rear support assembly to the vehicle. 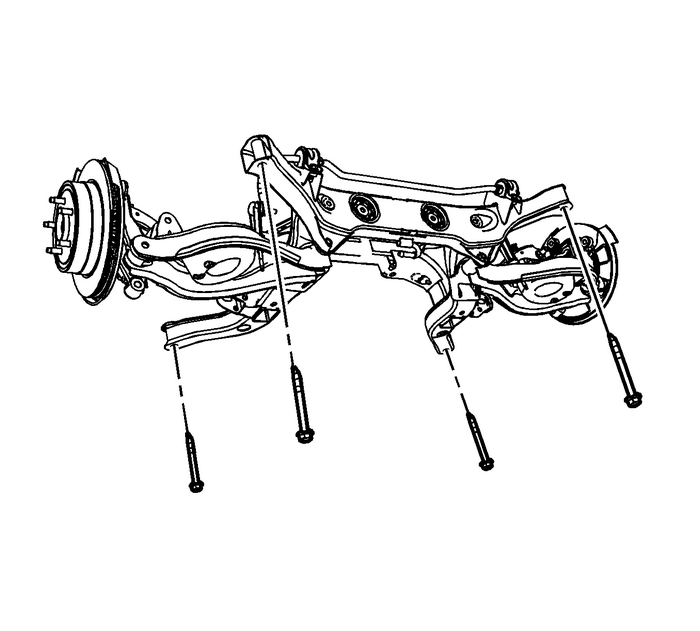 Install the 4-rear support to body bolts andtighten to170-Y(125-lb-ft).Install the rear differential. Refer toDifferential Replacement.Install the rear wheel drive shafts. Refer toRear Wheel Drive Shaft Replacement.Install the adjustment links. Refer toAdjust Link Replacement.Install the trailing arms. Refer toTrailing Arm Replacement. While holding the stabilizer link, install the stabilizerlink-to-lower control arm nut and tighten to15-Y(11-lb-ft). Remove the supporting wire and position the brake caliper andbracket assemblies back onto the knuckles. Refer toRear Brake Caliper Bracket Replacement.Install the rear brake hose bracket nut and bolt and tightento12-Y(106-lb-in).Position the wiring harness back to the original location,connect the routing clips to the rear support and upper controlarms. Connect the rear wheel speed sensor electricalconnectors. Connect the rear park brake cables through the mountingbrackets and onto the park brake actuators. Install the rear park brake cable routing bolts to thetrailing arms and tighten the bolts to12-Y(106-lb-in).Install the exhaust muffler. Refer toExhaust Muffler Replacement.Install the tires and wheels. Refer toTire and Wheel Removal and Installation.Check the rear alignment. Refer toWheel Alignment Measurement.